Pictured taking part in the ribbon-cutting ceremony, left to right, are Holly Quaine, Heidi Reed, Dan Rhodes, Carolyn Kay Riggle, Larry Harris, Roger Pickens, Dr. Peter Hucek, Tom Homan, Tim Burkam and Rick Brown. Pictured are open house attendees touring the new outdoor courtyard at Willow Brook at Delaware Run, 100 Delaware Crossing West, Delaware. 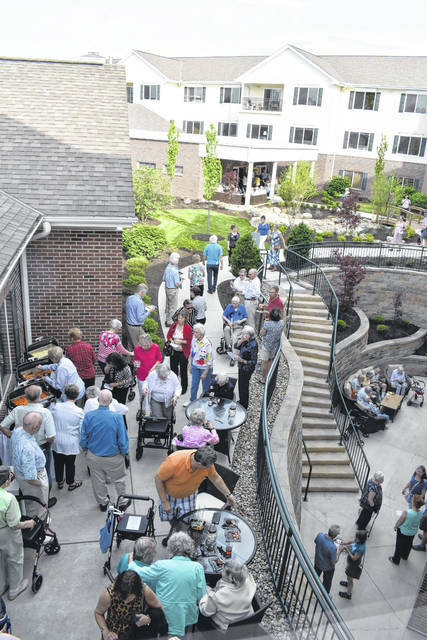 More than 450 people came to Willow Brook at Delaware Run last week to celebrate the opening of a new wing, which features medical offices and new rooms, apartments, and suites for assisted living and transitional living. Guests enjoyed food prepared by Willow Brook chefs and live jazz music by the Charlie Foxtrot Quartet. They toured new rooms and apartments and met staff from two new medical practices, Central Ohio Geriatrics and Blue Sky Therapy. Both practices are open to the general public. The event was held in conjunction with the Delaware Area Chamber of Commerce and featured a ribbon-cutting ceremony with Larry Harris, CEO of Willow Brook; Holly Quaine, president of the Delaware Chamber; Mayor Carolyn Riggle; City Manager Tom Homan; Willow Brook Board Chairman Roger Pickens; Tim Burkam of Blue Sky Therapy; Dan Rhodes of CRC; Rick Brown of Brown Calabretta Architects; Dr. Peter Hucek of Central Ohio Geriatrics; and Heidi Reed, Willow Brook assisted living manager. 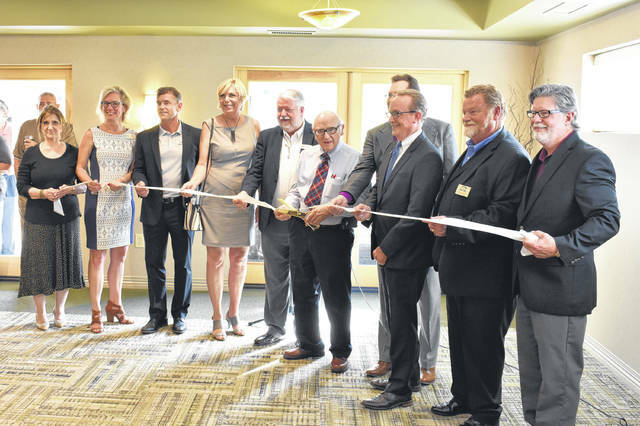 Furnished model apartments gave visitors the chance to view the 26 new assisted living rooms and suites, and six new apartments for transitional living. Willow Brook now has a total of 40 assisted living rooms and 15 transitional living apartments. Dr. Peter Hucek of Central Ohio Geriatrics welcomed people to his office, which will open June 13, and staff from Blue Sky Therapy were on hand to discuss their outpatients services, which include physical, speech and occupational therapy. Willow Brook added the new wing in response to the community’s growing need for housing and healthcare options for seniors, according to Harris. “I want to express my thanks to the entire Delaware community for supporting us and celebrating with us,” said Harris. Willow Brook at Delaware Run is located at 100 Delaware Crossing West in Delaware. It is a continuing care retirement community with accommodations for independent living, assisted living, transitional living and skilled nursing care. A not-for-profit organization, Willow Brook has another campus in Delaware and one in Columbus. For more information, please visit www.willow-brook.org or call 740-201-5640.